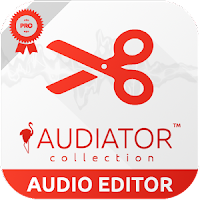 AUDIATOR Audio Editor for android is an editing app that give custom sound to your headphone and speaker based on the famous library ffmpeg. 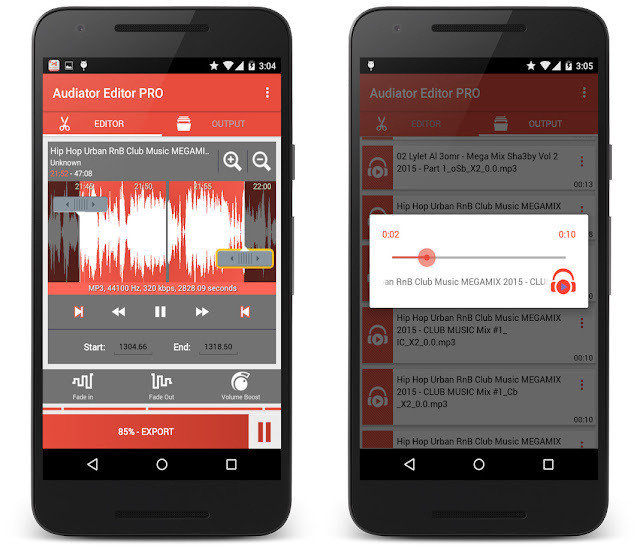 About ffmpeg, ffmpeg is number 1 in the world of multimedia processing and mp3 audio file making, therefore, AUDIATOR Audio Editor the mp3 cutter for android benefit from all its strength and speed and will give your headphone and speaker the best sound quality. AUDIATOR the mp3 ringtone maker for android have a very simple user experience, with only three steps, you can edit, cut and trim, boost, filter all the mp3 music within your android phone to give your headphone and speaker the best sound. 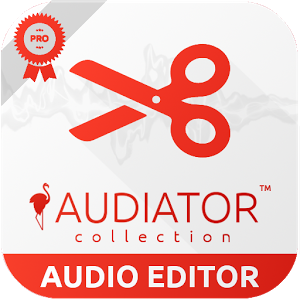 import mp3 music, audiobook, ringtone, records "+"
edit your imported music, play with the cutter, the filters, the booster in order to cut the best part of your music. run save "Export" to save the edited file. And finally, you can listen, compare, set as your Default Ringtone or for a specific Contacts, as you Alarm, Music File, Notification Tone and share the trimmed mp3 music via social media or emails. View a scrollable waveform representation of the audio file at 4 zoom levels. Set start & end for the audio clip, using an optional touch interface. Tap anywhere on the wave & the built in Music player starts playing at that position. Manually set the Start and End time(in seconds) by typing the values in text boxes at bottom of app. Set the new clip as default ringtone or assign to contacts, using this editor. Supported all mp3 audio formats in any length and any size. Background Mode that can work for hours in background if you plan to amplify all your music libraries while sleeping. a wealthy explorer to import from the mp3 music library of the smartphone or from SD memory with the possibility to search and import globaly. rich Audio Sample Rate options. the user interface is rich in terms of animation and it is based on Material Design and google guides. the ability to read mp3 music with headphone and speaker, share mp3 music, modify mp3 music and tone as the loud amplified result files. queue management and batch processing. supports all ARM devices (CPU). A direct connection with the development team to report and suggest new features.